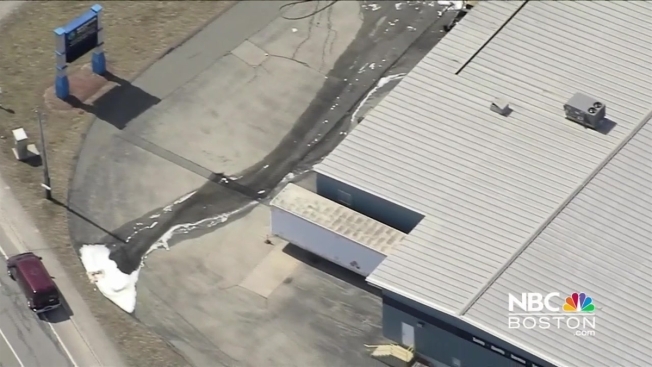 Sky Ranger footage from the scene of a reported car explosion in Manchester, New Hampshire, Monday morning. Three people were injured after pressurized gas canisters exploded in a car near a gas company in Manchester, New Hampshire, Monday morning. Manchester fire officials say crews responded to reports of a gas explosion near Matheson Industrial Gases on South Willow Street, and when they arrived on scene, they found a car consumed by the subsequent fire. Firefighters learned that the burning car had two pressurized cylinders, one containing oxygen and the other acetylene, in the back. Eventually, crews were able to get the car fire under control and cooled the cylinders to the surrounding temperature, and state police's HazMat Unit and bomb squad rendered them dormant. Steve Hebert, who took a photo of smoke billowing from the site, said the sound of the explosion "shook our building." Sky Ranger footage from the scene shows crews around a burned-out car.